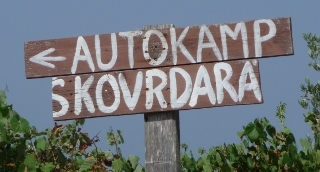 Heading north from Nin brought us to the end of Dalmatia. For the last month, we’ve been in just one region of Croatia – and it’s been beautiful. As we started to turn the dog-leg that’d bring us into the Kvarner Gulf instead, the landscape started to change rapidly. 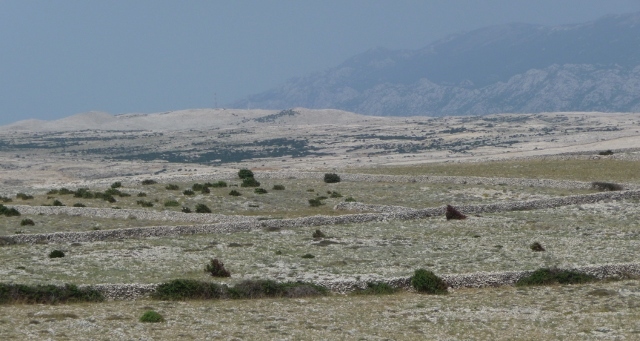 Instead of the lush vegetation of Dalmatia, a harsh and barren rockiness started to take over. In the distance, we could see the narrow straights between the mainland and the island of Pag, with a bridge linking the two. Our next stop-over beckoned. Once we crossed the bridge, there was no doubting we were in very different terrain. The eastern side of the island, running alongside the mainland, is almost entirely devoid of any kind of vegetation. 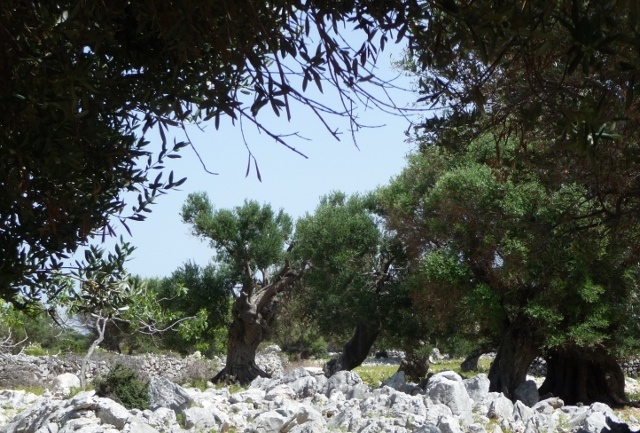 The western side, protected from the harsh Bura wind which blows over the Velebit mountain range backing the mainland coast up, is not quite so denuded – but apart from scrubby sage brushland, there’s really only ancient, gnarled and twisted olive trees, their roots wrapped around the large rocks dotted everywhere. The sage is responsible for one of the island’s main claims-to-fame, the strong Paški Sir cheese. Many, many sheep allegedly (they all hid from us) roam the hillsides, feeding almost exclusively on the sage. The cheeses are then washed in salt water and left to mature in the salty air, leading to a very different taste. And Paški Sir was all we could find for sale as we drove through the various tiny settlements dotted up the first half of the island. Unfortunately, what we really wanted was a couple of cold drinks. As we drove past yet more salines and reached Pag Town, we found them, finally. The current town is of 15th century Venetian origin, lining the two opposite shores of a big and well sheltered bay. The old core of the town sits on one side, linked to the modern town on the other by a very heavily restored stone bridge and a modern causeway. As we wandered through the streets, old ladies sat in the shade of doorways, next to boards displaying their lacework for sale. No naff touristy lace shops here – just Grandma and her own work. Crossing the causeway also brings you to the original town, a few kilometres further into the bay, opposite the salines which provided its wealth and – ultimately – led to its downfall. The insubstantial ruins of the old town are all that the troops from Zadar left when they attacked at the end of the 14th century, trying to reduce competition for their own salines. The modern side of Pag town also contains a sprawling and crowded beach, complete with JetSki rental and huge plastic waterslides. This end of the island is touristland. Apart from a tiny campsite in a little coastal village, Pag town’s nearest campsite is about half-way between Pag and the island’s other town, Novalja. We knew it was big, and thought we knew what to expect. Nope. We’ve just not been to any really big sites on the trip so far. From reception, we were told that we’d be taken to see some of the pitches available to us by electric golf buggy. This seemed like a good idea given the heat, but we quickly realised that it’s actually essential to prevent punters getting lost, since even our driver had to do three-point turns a few times, having taken a wrong route. We headed on, up the island. Novalja didn’t detain us very long at all. A modern town, it’s billed as “Croatia’s Ibiza”, and Zrće beach just south of the town is a 24hr open-air nightclub through July and August, complete with shuttlebuses to take people to-and-from their town-centre accommodation. Please tell me I’m not getting old? Please? North of Novalja, though, the island returned quickly to desolate beauty, before we reached the northerly tip and a small harbour. Just befo re here, though, we’d spotted some small and temptingly rustic signs to campsites somewhere <waves hand> over there. We followed one, and found a cracking small site. Not only was it far more beautiful than the mega-corporate-resort-sprawl, but it seemed to be full of vans just like ours… Of the ten or so other vans on the site, ours took it up to four T25s. It was hot – despite being past 4pm, the thermometer read 36 degrees in the shade of the small shack that seemed to combine as bar, reception and family summer house for the site owners. The sea’s beckoning could not be resisted for long. We seemed a world away from Novalja’s concrete and clubbing – except for a persistant dull bassline drifting over the sea, as if from some aquatic chav’s Vauxhall Corsa. It surely couldn’t have been the clubs – a dozen kilometres away, and on the other shore of the island – could it? Surely it must have been some kind of party cruise boat? None was to be seen. 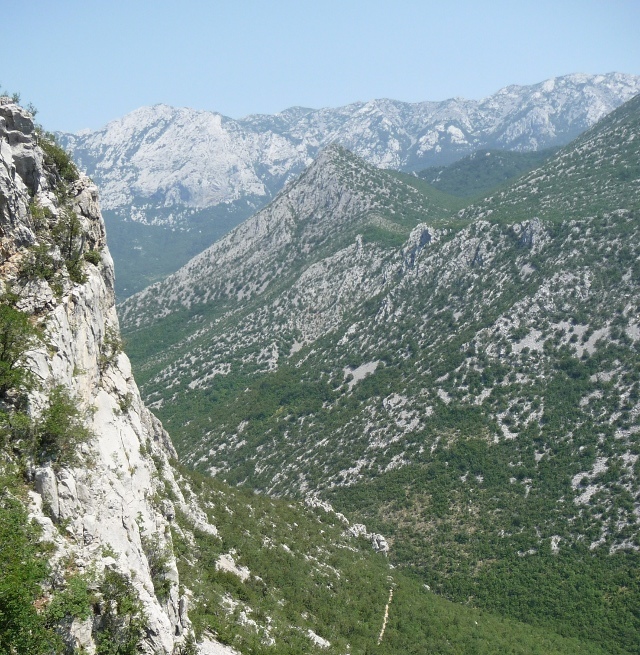 We left Pag, and returned to the mainland, heading for the Paklenica National Park, a pair of canyons into the Velebit mountains. The oppressive early afternoon heat was having an effect on the park rangers, too – as we paused at the park entrance and slowly mooched from the van towards the hut, one ranger barely lifted his head from his sleeping position on a shady wall. His colleague was sprawled inside the hut, and looked horrified at the thought somebody might actually want to visit. His attempts to dissuade us were unnecessary, since we were just finding a map and information for the following morning. When we arrived, barely past 9am, the park was already in full swing, having been open for three hours already. 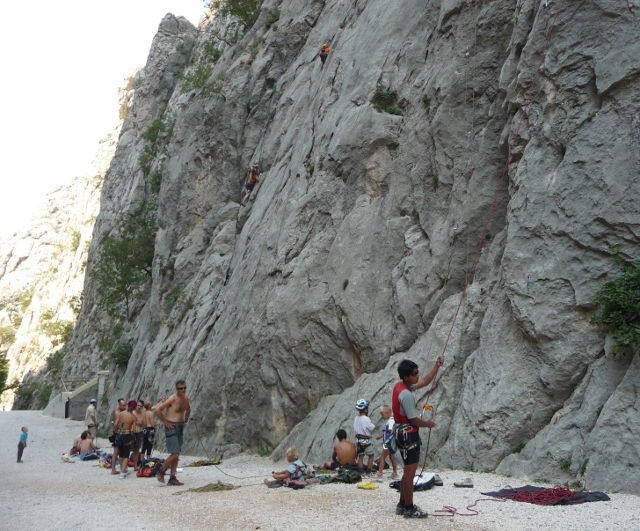 It’s a climber’s playground, and every single rock wall lining the pathway up the canyon was snaking with rope trailing below people clinging on by their fingernails. We continued up the path, following a dry river bed lined with huge boulders, and eventually reached a sign. We could continue up the canyon’s bottom, or head up to the cave of Manita Peć. We chose the latter, and promptly lived to wonder if this was wise. The path snaked back and forwards up the sun-baked wall of the canyon, rising above the treeline before very long. Every time we thought we must be nearly at the cave, we spotted a glint of colour from another walker somewhere above us. The views were utterly stunning – mountains lightly glazed with heat in the distance. Eventually, though, we did arrive. Even the people who found the cave, years ago, thought this a tough climb. They were looking for sources of water in this parched environment, and clearly a good swathe of them thought this a fool’s errand, as can be seen by the name – “Crazy man’s cave”. 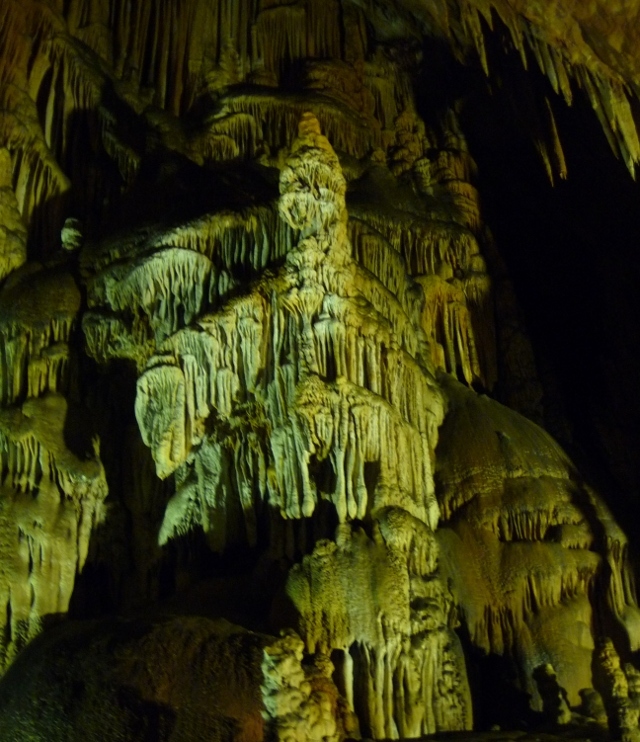 The cave’s filled with rock formations, stalactites and stalacmites, and can only be visited with a guide. The time came for the next group, and the guide started her introductory talk with the words that we should don any warm clothing we had with us. This was, of course, greeted with wry laughter – a constant nine degrees sounded like heaven from where we were all stood. We walked down into the cave, with the few lights picking out shapes, shadows and colours all around, marvelling at just how much time it must take to create such structures, one tenth of one millimetre each year. Only too soon, it was time to leave the cool and dark behind, and emerge, blinking, into the glare, ready for the trek back down the slopes and canyon to the van. This entry was posted in By Country - Croatia, Food stuff, Travel stuff. Bookmark the permalink.